BREAKING: Skyfire for iPhone, iPad, iPod touch Now Available for Download ! 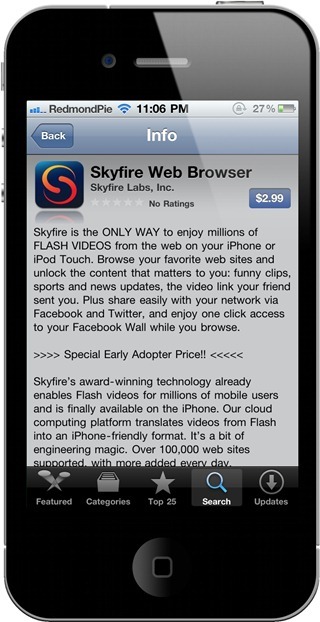 The much anticipated Skyfire web browser for iPhone, iPad and iPod touch is now available for download! It was originally expected to go live this Thursday, but for whatever reason, it looks like they have released it today as it is now available on the US iTunes App Store ! • Be social: Share via Facebook and Twitter. • Stay in touch: Unique Facebook ‘Quickview’ allows you to see your wall and feeds with one click. • Click the ‘Explore’ button for related videos, news trends, photos and tweets! Skyfire can be downloaded from the App Store for $2.99.